Take me back to my health food store days, falafel!!!! (when I actually lived close to the store; thank you amazon, where would I be without you?!). 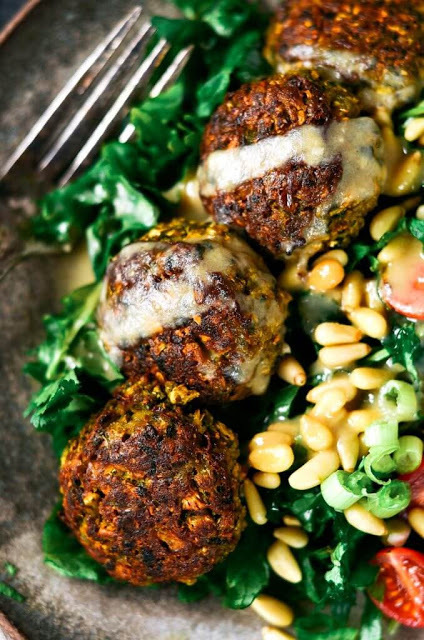 These warm scrumptious balls of herbs and earthy flavor are pretty much heaven. Don’t you just love mixing up things with cumin, turmeric, and cilantro! All those happy colors and vibrant feels makes my heart so happy! Go ahead, try it; resist not being happy when you make these paleo falafels. My absolute favorite part about falafels is their distinct aroma. I could catch it a mile away (and come running!). This bowl of healthy goodness is incredibly easy to make! Because, I used my food processor to make the entire batch of falafels and tahini dressing. 2 cups minced cauliflower To make minced cauliflower, just blend the cauliflower in your food processor until it's minced. 2 teaspoons maple syrup or date paste for whole30. 4-8 cups baby kale Make your salad as big or small as you want. In a food processor blend all the ingredients, except the minced cauliflower and olive oil. Blend until the herbs are minced. Once the herbs are minced, add in the minced cauliflower and pulse until combined. Form the falafel dough into 16 1 1/2" round balls. Use a pastry brush and brush each falafel with olive oil. Cook for 20 minutes on 400F then rotate the falafels and cook for another 20 minutes. Combine all the ingredients for the tahini dressing in a blender or food processor and blend until smooth. 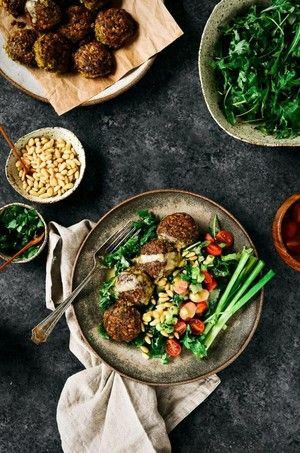 Plate the greens then top with falafel and tahini dressing.